The end of bootcamp: Making the switch to cloud-based CAD modeling on your Mac. My five year Boot Camp is over. As a sustainable designer and educator, I have been using Boot Camp to run SolidWorks and Rhino on my MacBook Pro since 2011. This approach worked well enough, but after using Autodesk Fusion 360 for the last ten months, I made the decision in June to reformat my hard drive; no more Windows, no more Boot Camp. Fusion 360 has provided the sought after combination of parametric development and organic surface modeling all while being able to operate from the cloud on my laptop using Mac OS X. ​Surya Vanka, chair of the IDSA.org 2015 conference, photo by Barent Roth. Once I started working with a true history tree in 1999, I rarely modeled with any software that did not have the ability to update whenever the inevitable change was required. This essence of parametric modeling changed our profession’s modeling strategy and became an industry standard for industrial designers. You can therefore imagine my hesitation to engage with any CAD vendors offering new software when I returned to the IDSA.org annual conference in Seattle last summer. A serendipitous lunch changed my view. While enjoying my vegan option during an open lunch, I began grilling the unsuspecting Autodesk representative who happened to sit at our table about their new CAD program, Fusion 360. As an independent designer, when he said Fusion 360 was free, I was sold, if that’s even the right expression when the program does not cost anything. The fact that it was cloud-based and collaborative only made it more appealing. This Autodesk representative had sold SolidWorks for thirteen years and made the switch when he saw what Fusion 360 could do.. This conversation was enough for me to take the first step to download the program and give it a try. I have been teaching Introduction to Computer Aided Industrial Design with SolidWorks and Rhino to future industrial designers at The New School - Parsons for the last five years. 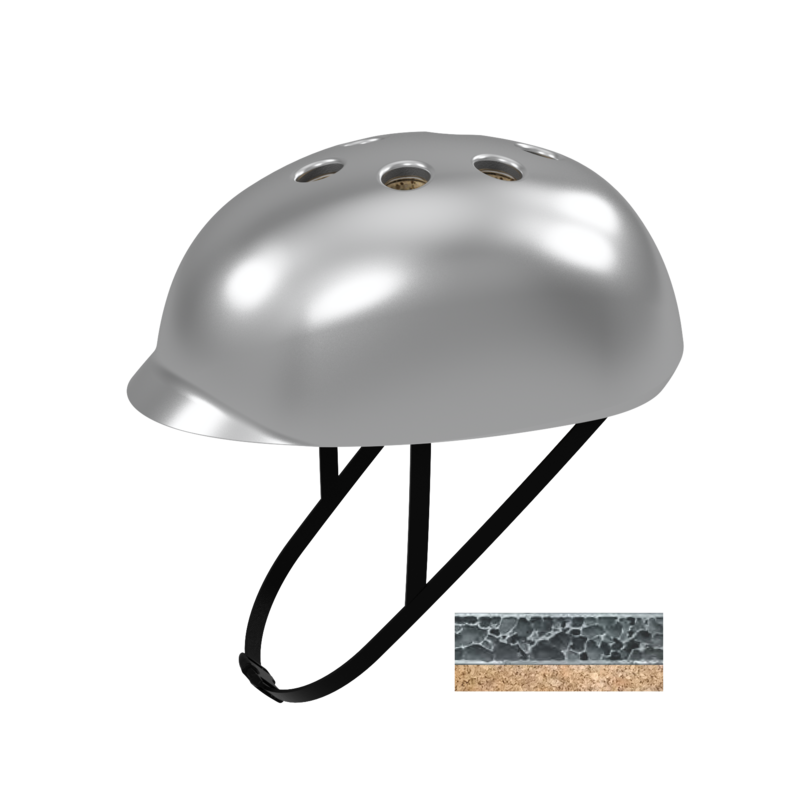 Additionally, almost all of my independent design work has been done on SolidWorks, but after tinkering with Fusion 360 for a couple of weeks I decided to use it last fall for modeling a BikeShare Helmet that I was going to be entering in the Cradle to Cradle Products Innovation Institute’s sustainable product design competition. The competition was low risk, if the program was inadequate it would only be affecting my project, not any client work, and high reward—the BikeShare Helmet design ended up winning Best Professional Project in the competition. The BikeShare Helmet was designed through several iterations of drawings and clay models. When I began modeling the final form in Fusion 360 I anticipated using both the parametric capabilities and the surface modeling tools, but after using the solid modeling tools to create the exterior aluminum foam shell it was easy to create the interior cork cushion without needing to enter what Fusion 360 calls Sculpt mode. Sculpt mode in Fusion 360 is like having a surface modeling program built into the software. I thought I might need this free form ability, but on this project it turned out to be unnecessary. The features I was familiar with using from my experience with SolidWorks were all available in streamlined features in Fusion 360, so the transition to this new CAD modeler was much easier than I expected. And while I would certainly create the BikeShare Helmet a bit differently now that I know the program more thoroughly, I was able to capture all of the nuances in my original design intent. 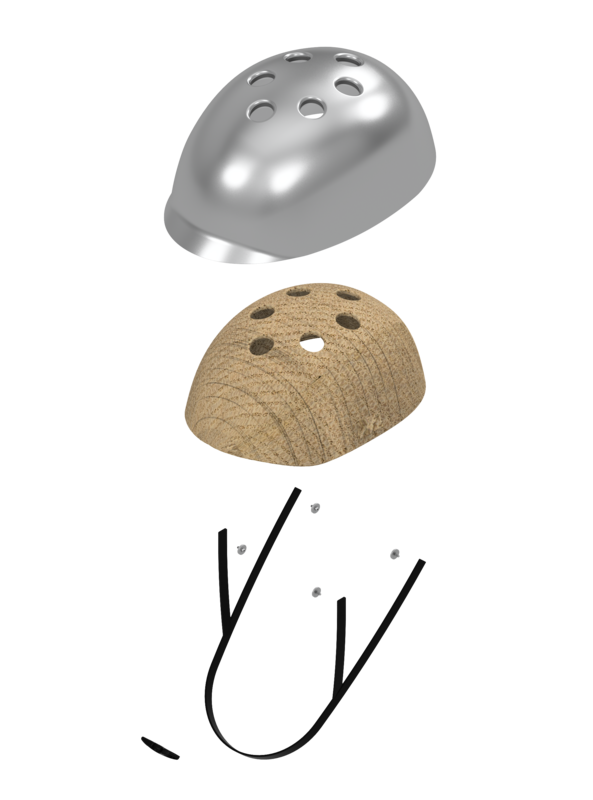 Finally, when I needed an exploded view to illustrate the helmet components, I found a video tutorial online explaining just what I needed after a quick google search. Exploded view of the BikeShare Helmet. Having seen first-hand how Fusion 360 performed for my own work, I felt compelled as an educator to share these advantages with my students. Fortunately, I teach in a university program that embraces experimentation, so I was able to integrate the program into my Computer Aided Industrial Design course in the following spring semester. Students worked with SolidWorks, Fusion 360, and Rhino, and then were able to choose which program they wanted to use for their final project—12 of 13 students chose Fusion, and the one that chose Rhino had been working with that program for years. I am certain they benefited from learning SolidWorks at the beginning of the semester, but even so I was shocked at how quickly they took to Fusion once I gave them the basic overview. Fusion 360 is to SolidWorks as Google Docs is to MS Word. Sure, Word has hundreds if not thousands of features, but everything you really need to write a paper is easily found using a cloud-based Document in Google Drive. Fusion doesn’t (yet) have all the tools that SolidWorks does, but the program has everything you really need organized into streamlined features so that if you have used SolidWorks before, you will be able to pick up Fusion very quickly. There is another factor in why the students excelled with Fusion: accessibility. By being able to model on their laptops, Mac or PC, anywhere they wanted, rather than having to go to a computer lab, the students modeled more. So quite simply, when they modeled more they learned the program faster. Here's a project by two of my sophomore students, Tarika Jain and Jared Sokolowski, who modeled a carry cart in Fusion 360. Fusion 360 is the software I have been craving since I started using CAD professionally, combining a robust history tree with free form surfacing modeling capability into one free, continuously updating, cloud-based program I can run on my Mac. I am only just now taking advantage of the collaborative abilities. Download the program, check out the resources provided by Autodesk and the Autodesk Design Academy and see for yourself, the Autodesk account is free, and Fusion 360 runs on either your Mac or PC. If you are like me, and have been CAD modeling on your Apple computer, your Boot Camp days are numbered. Barent Roth is a designer and professor dedicated to creating and teaching the importance of sustainable products, practices, and services. An educator at heart, he has taught at both of his Alma Maters; the University of Illinois where he received his BFA in Industrial Design, and the University of the Arts where he graduated with honors for his Master’s degree focusing on Sustainable Design. Co-founder of the award winning sustainable to restorative design firm Grow-Design, and the creator of the LA Green Drinks network, Barent started teaching a Green Living Workshop with Sustainable Works, a Santa Monica based non-profit committed to Environmental Education and Action, and quickly rose to Executive Director of the organization. In addition to educating/advocating about the urgency for large scale sustainable efforts, he works to continuously improve his own personal impact by supporting sustainable businesses and cooperatives, enjoying a vegan lifestyle, purchasing renewable energy, and participating in the emerging paradigm of collaborative consumption. Having married a New Yorker while living in California, Barent moved to Brooklyn in 2011 to live with his new wife, have a daughter and lower their ecological footprint (currently 1.34 planets). He now teaches courses on sustainability and/or design at The New School in New York City while designing sustainable solutions. Barent’s design for a BikeShare Helmet won the 2016 Cradle to Cradle Product Design Challenge for Best Professional Project.